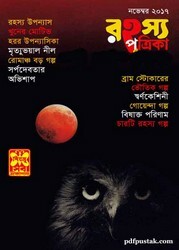 Rahasya Patrika is the best and most popular monthly base mysterious magazine in Bangla which is publish from Seba Prokashani, Dhaka, Bangladesh. Now we want to share the edition of November, 2017. The main cover story of this edition are- one mystery novel- 'Khuner Motive, one horror novel- 'Mrityubhoyal Nil', one Adventure novel- 'Swarpodebotar Avisap', one ghost story- 'Swarnokeshini', one detective story- 'Bishakta Parinum' and there are four more mysterious stories in this edition. The mysterious magazine has 150 pages, 12mb file size.